Probably the best of this remarkable series. Where does The Bat rank among all the audiobooks you’ve listened to so far? 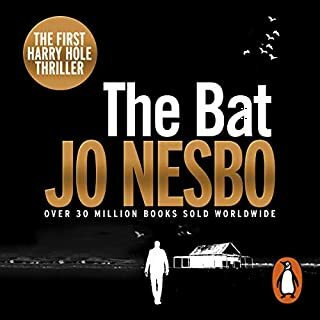 The Bat is a must-listen for any Jo Nesbo fan. Harry Hole's beginnings are laid bare in stark detail and so much insight into the character he becomes in later books in the series is gained from this one. By far it is also one of the best in the series, not just because it is the first, but because the story turns back on itself so many times I was astonished by Nesbo's ability to slow the pacing of a novel to almost a crawl before giving you whiplash with the way he turns the story on its head! What other book might you compare The Bat to and why? I would compare The Bat to The Snowman, and I have actually gone back to listen The Snowman again to understand the tie in between the two. A character from The Bat makes a re-appearance of sorts in The Snowman, and again there is more insight to be gained into why Harry is the way he is. Have you listened to any of Sean Barrett’s other performances before? How does this one compare? Sean Barrett does an excellent job with all of the Harry Hole novels. I enjoy his measured pacing very much, and the way he doesn't force his voice higher to create female character tones but rather softens his pitch. Another excellent performance. Definitely I would have listened to this in one sitting had I been able to! I am looking forward to rounding out my Harry Hole series, and I am very glad that Audible was able to bring to life the first book in the series. A blinding snowstorm - and a homicidal maniac - traps a small party of friends in an isolated estate. Out of this deceptively simple setup, Agatha Christie fashioned one of her most ingenious puzzlers, which in turn would provide the basis for The Mousetrap, the longest-running play in history. 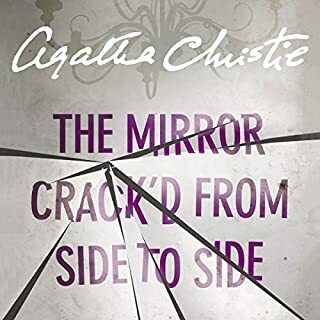 From this classic title novella to the deliciously clever gems on its tail (solved to perfection by Hercule Poirot and Miss Jane Marple), this rare collection of murder most foul showcases Christie at her inventive best. Joan Hickson IS Miss Marple! This compilation brought together some of my favourite Agatha Christie stories and narrators. The title track was both scary and mysterious, and the setting of a snowbound house with a group of strangers was remarkably well done. 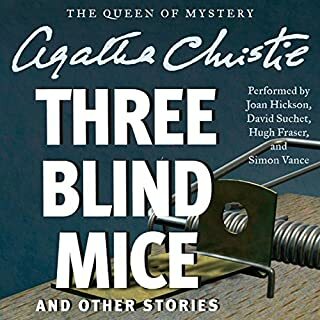 I thoroughly enjoyed the range of narrators, Joan Hickson and David Suchet never fail to please, and Hugh Fraser brought a different sound to Poirot but not an unpleasant one. All in all, a thoroughly satisfying listen! It begins with a phone call. Gordon Reeve's brother has been found dead in his car in San Diego. The car was locked from the inside, a gun was in his hand. In the US to identify the body Gordon realises that his brother has been murdered. What's more, it's soon obvious that his own life is in danger. Once back in Scotland he finds out his home has been bugged by professionals. But Reeve is a professional too. Ex-SAS, he was half of a two-man unit with someone he came to fear, then to hate. Excellent introduction to this author! 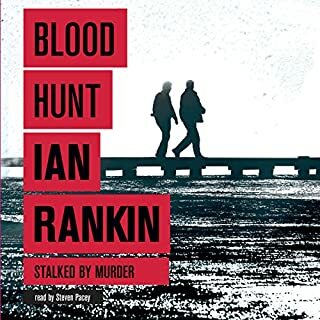 I had never read Ian Rankin prior to purchasing this audiobook, but something about the synopsis offered by Audible caught my attention. When I finally bought it, I was not disappointed. The antagonist is also well-developed, and quite chillingly believable in his "evil". I may never again hear "Row, row, row your boat" without getting chills down my spine! Steven Pacey did an excellent job with the narration, giving each character a distinct voice and personality, even those that required a bit of a brogue because they were Scots. His pacing was excellent, and he kept the suspense going where he should with perfect timing. Even during some very technical descriptions of pesticides and their effects he did not become boring or pedantic. A good mystery, complimented by some fine reading. One minute, silly Heather Badcock had been gabbling on at her movie idol, the glamorous Marina Gregg. The next, Heather suffered a massive seizure. But for whom was the deadly poison really intended? Marina's frozen expression suggested she had witnessed something horrific. But, while others searched for material evidence, Jane Marple conducted a very different investigation: into human nature. Another excellent Agatha Christie mystery, ably read by Joan Hickson. The to-be-expected whiplash moment is present, as just when you think you have it all solved, she turns everything on its head. Joan Hickson delivers another solid performance, bringing her vocal range and subtlety to bear on a rather wide cast of characters. She manages to convey character with the pitch and pace she gives to the various members of the "cast", and makes each of them unique. Very pleased with this purchase, always an excellent combination, this narrator and author. 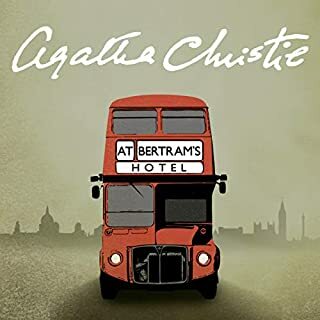 When Miss Marple comes up from the country for a holiday in London, she finds what she's looking for at Bertram's Hotel: traditional decor, impeccable service, and an unmistakable atmosphere of danger behind the highly polished veneer. As with every Agatha Christie, this one features a couple of breakneck twists that keep you guessing to the very end. My only complaint would be there was something of a lack of closure as the "bad guy" wasn't "caught" in the usual way. For all that though, still a good listen. This was my first time listening to this narrator, and I am more used to Joan Hickson's somewhat more "age-appropriate" voice for Miss Marple. Notwithstanding, Ms. Cole did a good job with the range of voices, and made for an enjoyable listen. 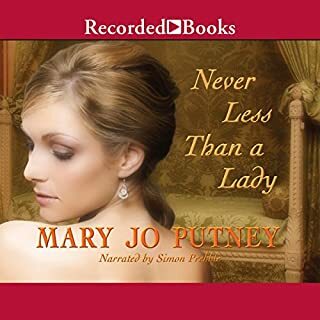 RITA Award-winning, New York Times best-selling author Mary Jo Putney is justly celebrated as a master of the Regency romance. Here Alexander Randall is the last heir to the Earl of Daventry and he must find himself a bride. His prayers are answered in the form of distressed midwife Julia Bancroft. But though their union would benefit both parties, Julia is reluctant to surrender her heart. I really enjoyed this performance and this story. I was very leery about trying another romance novel as an audiobook, my first romance audiobook experience didn't end well (in fact, it hasn't ended, I can't bear to finish it). However, Simon Prebble gave a very enjoyable performance of one of Putney's usually enjoyable Regency romances. His pace and rhythm were entirely appropriate and his voicing of the various characters was very well done, indeed. I particularly liked that he did not try to force his voice to some ridiculously high pitch for the female parts, rather he adopted a softness of tone which he even managed to vary for different female characters. The story itself is characteristic of Mary Jo Putney, there is a wide cast of characters from related novels, but they manage not to encroach too much on the central characters' development, something I have always appreciated about her "serial" books. Apart from the feeling that the story ended somewhat abruptly, likely because the characters will re-appear in subsequent novels, I thoroughly enjoyed this particular listening experience.